The GMC Canyon is often outshined by the popularity of the GMC Sierra, but this small pickup truck has a lot to offer and has for many years. GMC first introduced the GMC Canyon as a way to balance out their truck lineup with a third weight class that could give drivers every option possible, and as such, it became the smaller more compact pickup that fans of GMC have come to love. Affordable, efficient, and stylish, the GMC Canyon has always been a pickup truck that drivers can depend on when they don’t want all the bulkiness of a half-ton truck, but need more kick than other vehicle types can offer. Overall a used GMC Canyon is the ideal compromise for those who love the truck lifestyle but don’t want the common disadvantages such as their obnoxious size that can make it difficult to handle and their serious lack fuel efficiency. With its perfect balance efficiency, any used GMC Canyon you see for sale will be something that you can depend on to last, but it was around the second generation that this model really hit its stride with a more refined interior, a more powerful performance, and even a class-leading towing capacity that would set the standards till this day. Saving money and sticking to your budget has never been easier when you choose to invest in a used GMC Canyon for sale because whether they have simply been used or completely abused, these are the type of trucks that were designed to be resilient even when facing the worst driving conditions imaginable. At the start of generation two, there was the redesigned 2015 GMC Canyon. As a small pickup, this model is both balanced and affordable. While many may have overlooked it for bigger and more powerful models, the Canyon is a hidden gem waiting for its true potential to be unlocked. The exterior of this model takes a lot of design tips from the GMC Sierra when it comes to offering drivers a refined sense of boldness. Some highlights of the exterior of the powerful LED daytime running lights, projector-beam headlights, and a standard large rear bumper corner step. The interior on the other hands allows drivers an escape from the rugged truck life with premium features and materials such as soft-touch controls, aluminum trimming, quieting innovation, and the GMC MyLink infotainment 8-inch touch screen system, that makes you feel like you are taking a part of home everywhere you go. There are also a number of cab options. Under the hood, drivers will notice that the 2015 GMC Canyon is respectfully equipped with a commanding choice of engines. You can choose between either a 2.5L 4-cylinder or a 3.6L V6 engine. The 2.5L offers 200 hp and 191 lb-ft of torque with up to 27 mpg highway, while the 3.6L delivers 305 hp and 269 lb-ft of torque with up to 26 mpg. These can be paired with the more popular 6-speed automatic transmission, or the more exciting third pedal 6-speed manual transmission with the 2.5L engine. Both options come in either rear-wheel drive, but the 3.6L offers a 4-wheel drive option for the more adventurous soul. A used 2015 GMC Canyon for sale will become one of your most trusted allies on the road that will stay with you for many years to come through even the toughest driving conditions. This is why those that have chosen this underrated truck will often be loyal to for many generations to come. The 2016 GMC Canyon is a small pickup truck that measures to be 212-225″ L x 74″ W x 70-71″ H and highlights such things a proficient power, fuel efficiency, seamless handling, high-quality craftsmanship, and innovative technology. On the outside, the 2016 Canyon is a robust and refined piece of machinery that easily can take command of the road with its big-rig inspired grille, but will still look natural running everyday errands with its compact and cohesive design. As for the interior, you will almost instantly forget that you are in a truck. Modern, practical, and refined, the cabin is fitted with the finest quality materials available, and the best technology in the business at the time. The instruments are soft to the touch and easy to use, while the infotainment and audio system will bring you endless convenience and entertainment. Taking a look where it’s really important though, the 2016 Canyon offers drivers a choice between the two engines from the 2015 model and a brand new turbodiesel option. The base engine is a 2.5L 4-cylinder with 200 horsepower and 191 lb-ft of torque that can be paired with your choice of a 6-speed auto or manual transmission. The next option is a 3.6L V6 with 305 hp and 269 lb-ft of torque that is only paired with a 6-speed auto transmission. Finally, there is the biggest change to 2016 is a 2.8L turbodiesel engine that is only fuel efficient with 29 mpg highway but also produces 181 hp and an amazing 369 lb-ft of torque that will allow drivers to tow 7,700 pounds. Overall, this new addition to the powertrain lineup makes a used 2016 GMC Canyon for sale an even more appealing deal than any past model. 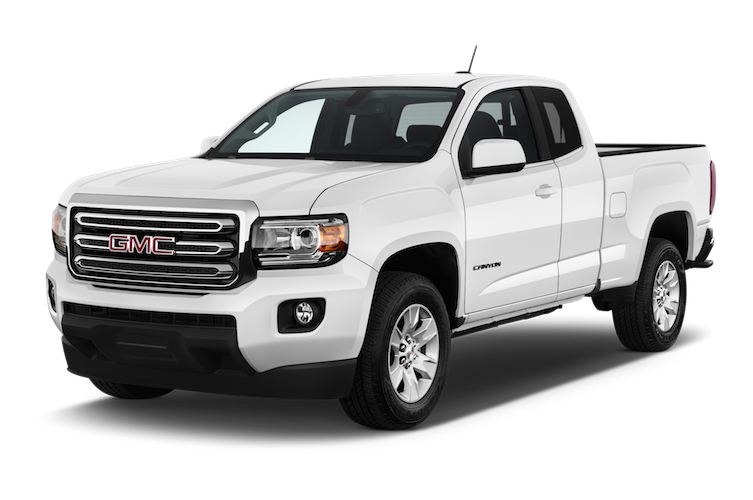 The GMC Canyon is a pickup truck that is designed to be more compact, which gives it a lot of advantages. A used GMC Canyon for sale will provide drivers with a strong list of commanding engines to choose from, a class-leading towing capacity, excellent fuel efficiency, easy maneuverability, a bold exterior with a refined interior, and intelligent features that are highly intuitive. Many things remain the same for the 2017 and 2018 model years due to their overwhelming success and advancement of the last two years. The exterior style is still an intriguing and appealing mix of refinement and boldness, while the interior is still designed to be elevated in a way that allows you to leave the road behind. The engine options are all still in place with a base 2.5L 4-cylinder with 200 horsepower and 191 lb-ft of torque, an advanced a 3.6L V6 with 305 hp and 269 lb-ft of torque, and an alternative 2.8L turbodiesel engine which produces 181 hp and 369 lb-ft of torque with 29 mpg highway. The max towing also remains in place at 7,700 pounds as well as the options between RWD and 4WD for select engines. In 2017 through a few new noteworthy additions were implemented such as a new 8-speed automatic transmission, an all-terrain off-road package, and standard teen driver technology. The 8-speed automatic transmission offered increased fuel efficiency and increased the driving appeal of the 2017 Canyon immensely. The all-terrain package was also a hit for those who have been longing to get a mid-size truck like the GMC Canyon out onto the trails. The added Teen Driver tech added offers regular reports and complete control over what your new driver can use, this is a standard feature that can breed the next generation of smart and safe drivers. All of these improvements keep the 2017 GMC Canyon fresh and ready to take on the world for years beyond anyone’s expectation. As for 2018, the changes were hardly even noticeable. A few standard features were added to the mix, but for the most part, it was a carryover from 2017. This is a sign of how well the GMC Canyon has evolved over the scope of the second generation into a vehicle that offers pickup drivers everything they desire including versatility of engines, powerful potential, efficiency, and high-quality accommodations. Overall, a used GMC Canyon for sale is a true gem of a vehicle that should never be overlooked if you feel like you would enjoy having a pickup truck that is ready to deliver and provide for you all day, every day, in every way. At McCluskey Auto, we are all about finding that balance between what you desire or need in a vehicle, and what you can afford. Our selection is vast, and our staff is resourceful so that no matter what kind of driver you are, what kind of tastes you have, what kind of life you live, and what kind of budget you are on, we will be able to provide for you in the best way possible. All we ask from those drivers who seek our assistance is to allow us the chance to help you by letting us know what you feel you need from this process and to give us your honest feedback at the end. We are all about satisfaction here at McCluskey Auto, and that is why we keep our inventory and staff as flexible as possible so that we can always deliver on our promise to find you that perfect automotive.